We can’t wait for this year’s 86th Academy Awards because the competition is fierce. Unlike most years when Hollywood insiders have a clear idea of who will take home that handsome boy named Oscar, this year the race for best picture is quite close between the space movie “Gravity,” historic biopic “12 Years a Slave” and comedy “American Hustle.” Nail biting stuff here! One thing you won’t see Art and I doing this year is throwing our popcorn at the TV set because this popcorn recipe is too darn good. The hint of tequila and lime compliment the sweetness of the caramel beautifully. At first you don’t taste the chile until it sneaks up in the back of your throat and you get just enough of a kick to want more. Preheat oven to 250 degrees F. Place popcorn in a very large bowl. Spray two large shallow baking dishes with cooking spray. In a medium saucepan over medium heat, melt butter. Stir in brown sugar, corn syrup, tequila, fresh lime juice, and salt. Bring to a boil, stirring constantly for about five minutes. Boil without stirring 4 additional minutes. Remove from heat and stir in soda and vanilla. Pour in a thin stream over popcorn, stirring to coat. Place popcorn in two large shallow baking dishes. 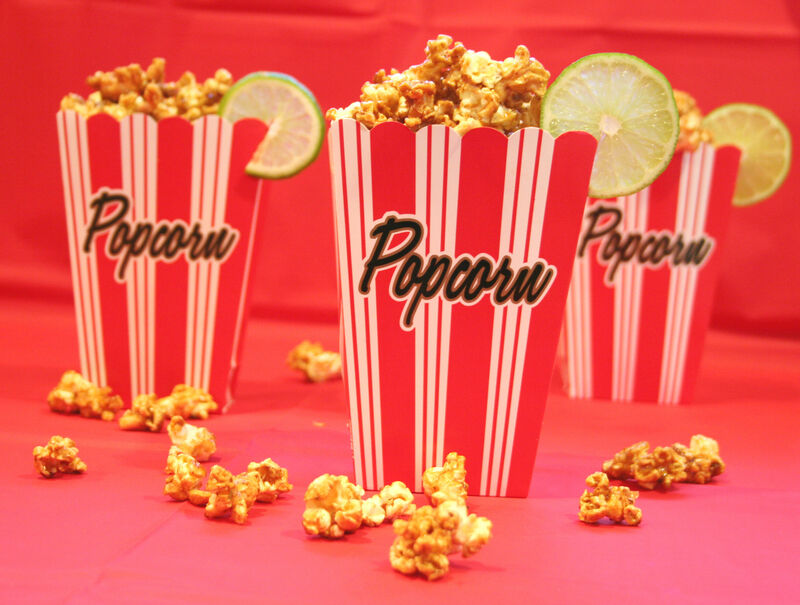 Zest limes over popcorn. Bake in preheated oven, stirring every 15 minutes, for 1 hour. Remove from oven and let cool completely before breaking into pieces.